Former Soviet soldiers take on their old enemies the mujahedin – on the soccer field. It wasn’t a matter of winning or losing, and the only shots were on goal, fired not from rifles but the studded boots of former enemies. A team of Soviet Army veterans of the 1979-89 war in Afghanistan finally made it back to the battleground of their youth this month, to take on Afghan soccer teams that also included former mujahedin fighters. Two matches were held – one in Kabul and a second in the northern city of Mazar-e Sharif. The games themselves were low-key events, unannounced and held under tight security in city stadiums before crowds of just a few hundred locals. Afghanistan is still at war, and such emotive events could attract the attention of insurgent factions now fighting NATO and Afghan government forces across the country. 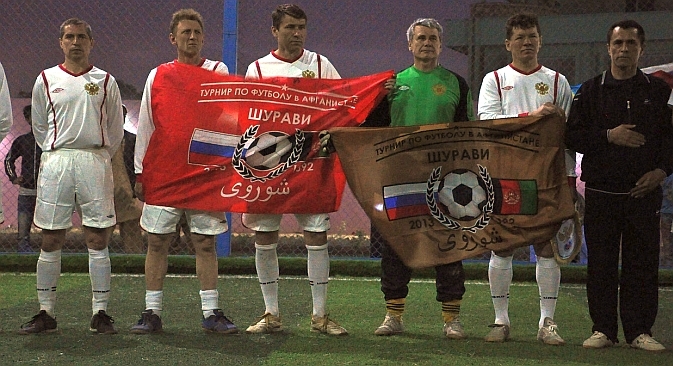 Battling on the pitch in white jerseys carrying the word ‘Shuravi’ (‘Russians’ in the local Dari language), players from various former Soviet republics initially scored a narrow 1-0 defeat against the hosts in Kabul. Instead of the customary 90 minutes, the match was reduced to 60 because of Kabul’s high altitude of 5,500 feet above sea level. The second meet in Mazar, broken down into five-a-side rounds, was declared a 5-5 draw. The spectators included former mujahedin fighters and civilians who have vivid and contrasting memories of a conflict that claimed the lives of some 15,000 Soviet soldiers and up to 1.5 million Afghans. Abdul Baseer was a third-grade student when Soviet forces occupied Mazar. His formative memories are of Soviet aviation bombings during which he saw the worst scenes of misery among the civilian population. But the ensuing years had their brighter moments too, he recalled. “Back then we did not have [constant] electricity and used generators. We had a 32-inch television we called Kareem, big and heavy - six people could barely move it,” said Baseer. By day, he and his classmates would throw stones and rocks at Russian vehicles, and Russian troops would in return toss back pens, notebooks, chocolate and biscuits. While some members of the crowd saw the era as a time of relative plenty, when the Soviets supplied food and commodities to the population, others were harsher in their description of the past. Former mujahedin fighter Muhammad Azeem recalled how Soviet forces “assaulted our villages, killed our people and bombed our houses … Nobody was held accountable,” he said, while intently following the play on-field. “The Soviet Union did some great work in Afghanistan too,” said Habibullah, 47, one of the younger generation of Afghans of the 1980s who travelled to the Soviet Union to study. But although perceptions varied, there seemed to be a consensus that the sporting events were a positive step towards healing the wounds of the past. While seven of the 15 former Soviet republics now have troops in Afghanistan under NATO operations, Russia has had no direct military involvement in the current conflict against Taliban-led insurgents. But it supplies and trains Afghan national security forces, and since 2001 wrote off more than $11 billion of Afghanistan’s sovereign debt and provided more than 40,000 tons of wheat, flour and other shipments. Concurrent to this aid, Russia is till trying to trace 263 members of the Soviet forces that went missing in the 1980s. Most are presumed dead, but a handful are known to be alive and have assimilated in Afghanistan since deserting or being taken prisoner. In February another MIA, an Uzbek former Red Army soldier was traced in the western province of Herat. But the search is as much about repatriating remains of soldiers to the families. Beyond the symbolic value, events like the football matches are also hoped to boost efforts to trace those still unaccounted for. “Our search for missing soldiers relies heavily on mutual understanding and the help of the local population,” said Alexander Lavrentiev, the deputy head of the Local War Veterans Committee, a state-supported organization that leads the work. “There’s no better way of forging good relations between people than events like this. Haroon Ahmadi, a 23-year-old medical student at Kabul University heard about the first game on his car radio. “My first thought was whether they would intentionally try to foul each other,” he laughed.